Tree’s “favorite things” list was such a hit, I thought I would make a list for Sage, my thru-hiking dog. Here are some of the things that make hiking with a dog a little easier for me. 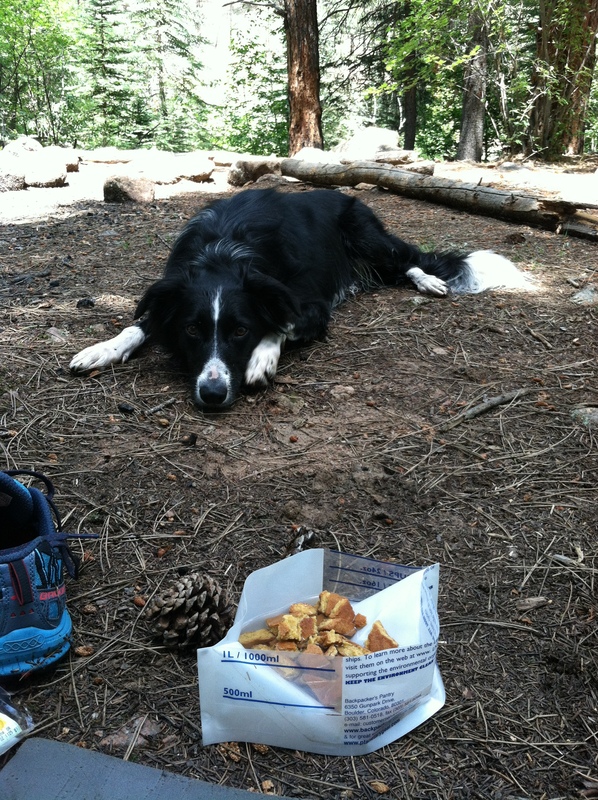 On trail, Sage loves that he gets one extra meal a day, in the form of a TurboPUP bar. They are basically meal replacement bars (think ProBar) for your dog. They are 500 calories, weigh a little over 4 ounces, and pack much smaller than dry dog food. Depending on what brand of food you buy your dog, these bars (he prefers bacon flavor) can be half the weight and volume of kibble! They go into each resupply box. 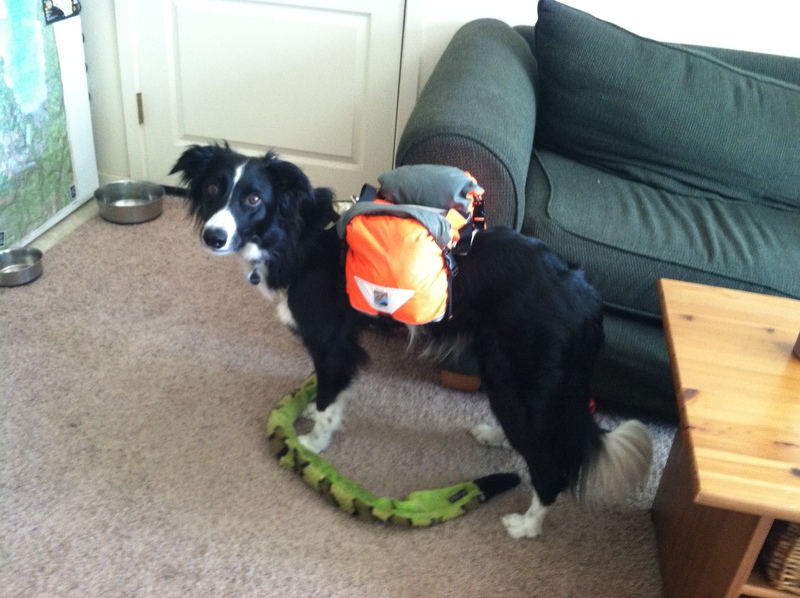 Sage’s favorite pack is made by Groundbird Gear, a dog pack company started by a long distance hiker. He has tried 3 other brands of packs and they always rubbed his armpits raw after about 1.5 weeks on the trail. The GBG packs are custom made to fit your dog and they are light weight. I like the roll-top version–as Sage eats through his food on a stretch, it is easy to reduce the size of the pack and makes it less likely to snag on bushes. 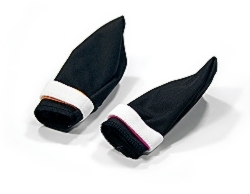 DogBooties.com makes really inexpensive (a set of 4 is $12) and light weight dog booties used by mushers and polar explorers. Sage likes them because, unlike the other brands he has tried, they are less built up and they stay on far better. It seems like they are less cumbersome to him than the ones with rubber soles. One thing I will say, though, is that they will wear down pretty quickly if your dog is off-leash and sprinting back and forth in them all day. 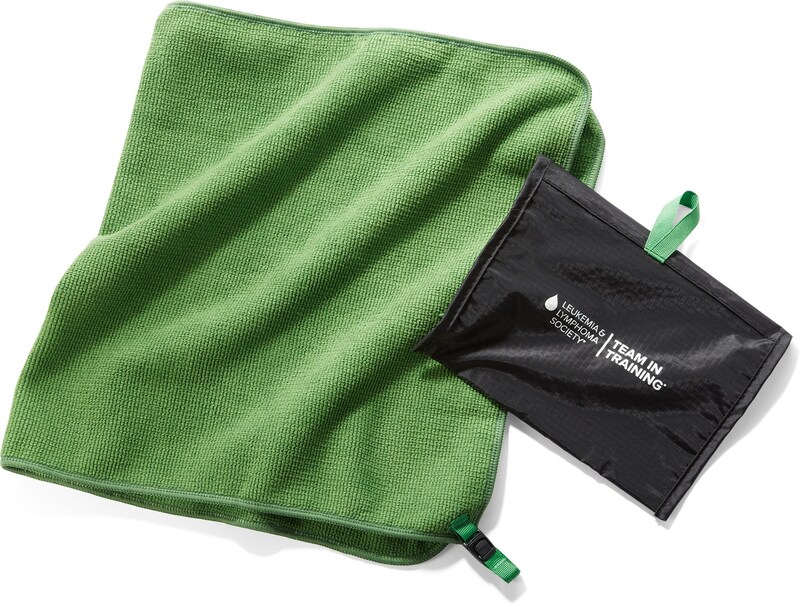 You will want to order the heavier denier model, and have a backup or two in the pack if that is how your pooch hikes. While I like the Gossamer Gear Polychro groundsheet for me, Sage likes his more durable soft-structured Tyvek. Cheap, light, durable, water resistant. When I lay it out for him at the end of the day, he runs right over to it and curls up on top of it. Sage is a wuss when it comes to the cold. I will wake up and reach over to him during the night and he will be shivering if it is below 45F out. On those nights, I will lift up the top of his custom made sleeping bag and he gladly snuggles right into it. 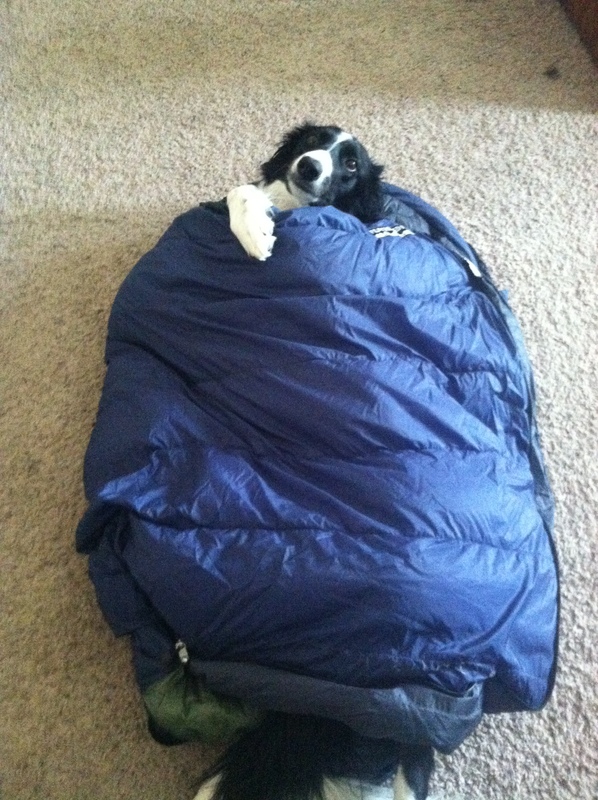 His daddy used a damaged men’s sleeping bag and shortened it. It weighs about 10 oz. Before the sleeping bag, I used a size XS down vest on him at night. That worked out okay, too. Also, these sound like a great lightweight idea! Sage anxiously awaiting his TurboPup snack mid-day. The Backpacker’s Pantry Pack Bowl is a cheap and light (0.8 oz. when cut to size) flat-folding bowl. They are similar to what you would have if you cut the bottom off a Platypus bottle, but with a larger base. It also has lines on it to help me measure out his kibble. When this thing comes out of the pack, Sage gets excited! Okay, I won’t lie. Sage could care less about his pack towel. But I like it a great deal, so I infiltrated his list. This thing has come in handy drying Sage off after a Colorado rainstorm, and once when Sage decided to roll in something nasty. 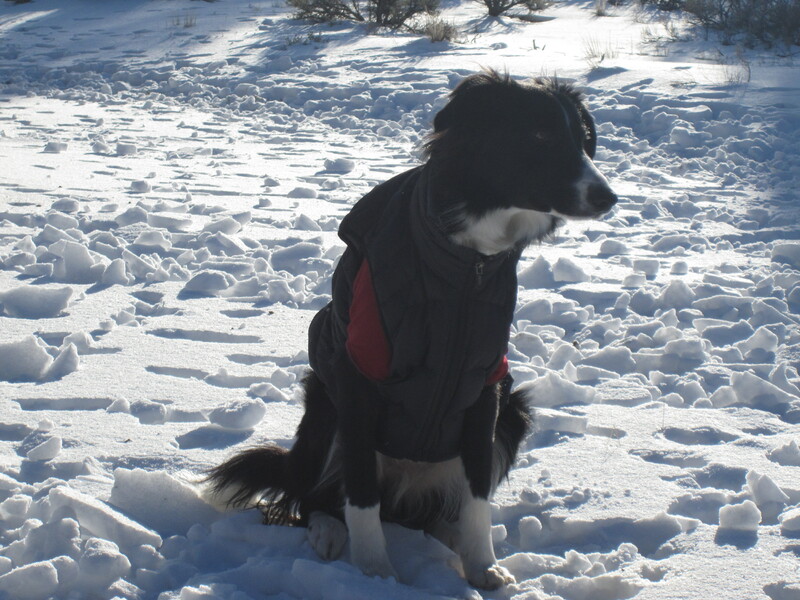 Again, Sage is a wuss in the cold, so he carries a square of Gossamer Gear Thinlight foam insulation. He enjoys the insulation from the ground at night. Mommy likes the seat pad during her lunch break. Win, win. Thanks for reading. 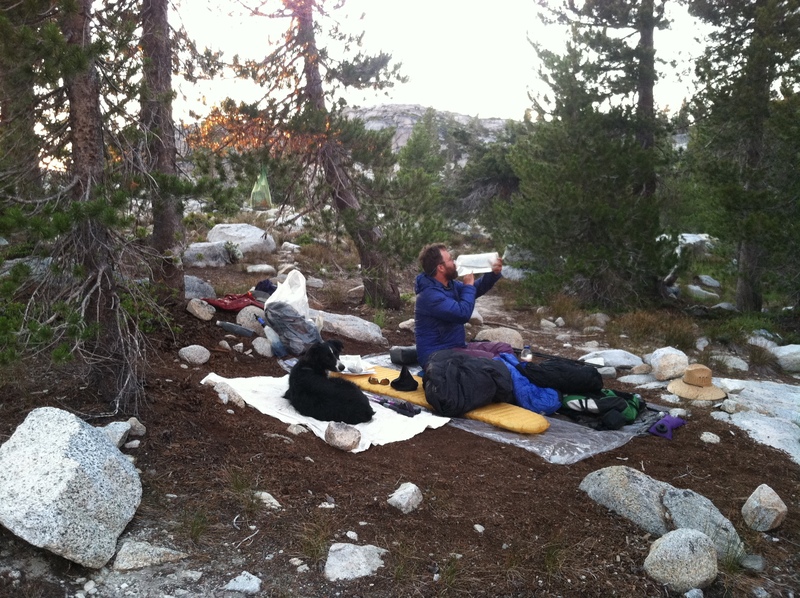 Keep following for upcoming articles on “Nutrition” and “Selecting a Trail” for Long Distance Hiking with Dogs. 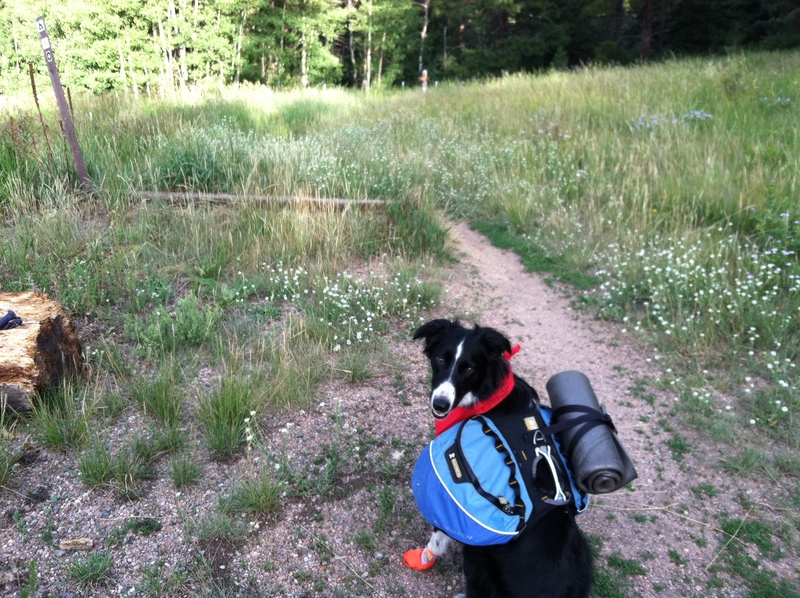 Sage the Wonder Dog has hiked the Tahoe Rim Trail, the Colorado Trail, and the Bigfoot Trail. Great list!! We always get a kick out of that photo of Sage in his sleeping bag 😀 hope you guys are well, healthy and enjoying the New Year!! What a great blog!! Love your list! The hubby and I are just getting into canicross and we love hiking. We’re hoping to do some backpacking this summer though. 🙂 Come check us out! 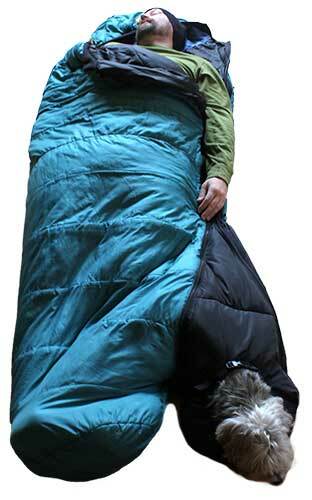 Love the sleeping bag idea!! Love the blog and the list! I think I will have to try out some of Sage’s favorite things for Rock. Love the list! Do you have your pad bungee’d to the top of Sage’s backpack? That’s Sage’s pad, but yes! Thanks for the Great List. I had a question about the Dog Booties. I have done a couple longer section hikes on the Oregon PCT with my pooch, but have yet to find a great pair of dog boots (one got holes the other caused a sore). I contacted the folks at dogbotties.com and they couldn’t provide a estimate on how long the boots would last. We are heading out again in a few weeks to finish up Oregon and want to find the best boots for him. We will mainly be on dirt and rock. How many miles do they last for your dog? I suppose that is a very tough question to answer. There are different denier booties in the site and it depends on whether your dog is on a leash and how heavy he/she is. Luckily, my dog doesn’t need booties the majority of the time. But, once on the Colorado trail he had to wear them for a week. He runs around like a mad man, back and forth, and the boots started to wear through in that week. They are somewhat disposable, but most dogs will tolerate them a lot better than the built up ones. 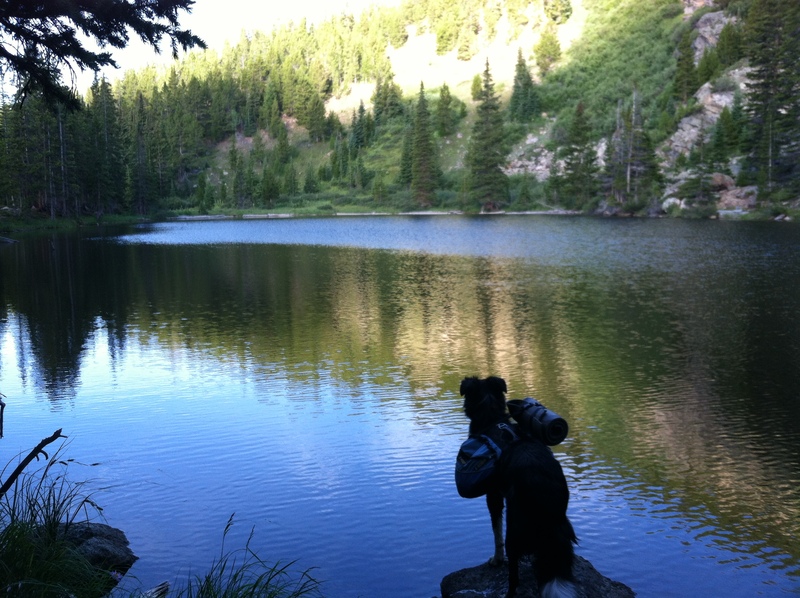 Thanks for sharing all this great info on long-distance hiking with your dog. I also have a BC, and it sounds like she has a similar hiking style to your Sage. 🙂 I was looking at the DogBooties site and saw that they had different closure types. What type of closure did Sage’s have that stayed on so well? We have Muttlucks for her in the winter but I have to be careful not to lose them; they do come off but so far I’ve seen it happen and recovered them from the snow (though they may be just a little too big, too). That’s fine when we’re staying local, but I’d hate to lose a pair on the trail when I may not have replacements. The closures they have on the site are Velstrap, Hook, or Loop. Hi Anna. Love BCs! I like the vela strap. It’s stretchy, so you can really crank it down without your dog getting mega paw. The don’t last quite as long, though. So, I usually buy 6 or 8 at a time. They’re so light it doesn’t matter. Thanks! We ordered 6 boots tonight. Looking forward to some good hiking with the pup. Thanks for sharing your list, this is really helpful as we plan for a weeklong trip. Great! I hope it all works for you. Everyone is different. Have a great hike! Thx for your recommendations or sage’s. I hike with Waldo, my Dalmatian. I just moved to NH, near Vermont and am considering the Long Trail. He (and I) LOVE hiking and are considering multi-day hikes…. Great! We haven’t hiked it, but I’ve heard it’s a good/safe trail for dogs.